Shaun has been hunting his entire life. 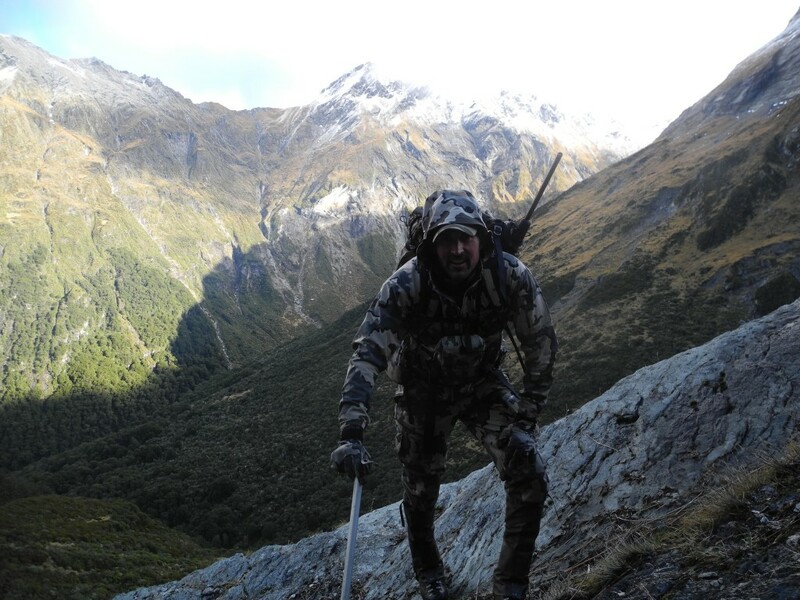 His passion for hunting and the outdoors lead him to the South Island of New Zealand where mountain hunting became his life. As an previous outdoor instructor, makes hunting with him very safe and everything is thought out and planned to the smallest detail. Plus he is incredibly easy to get along with and is an incredible hunter and can spot game like no one else I have ever hunted with. 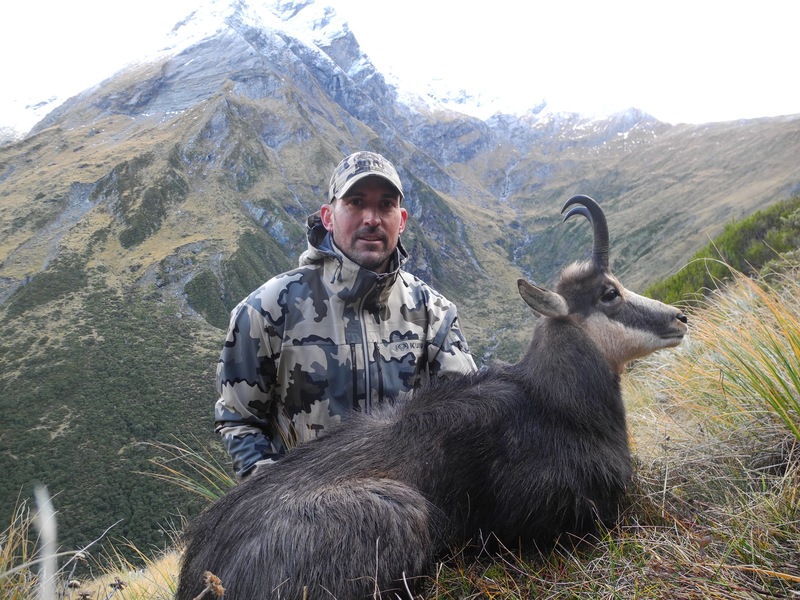 Shaun has guided for one of New Zealand’s top hunting outfitters and he has learned what it takes to make each clients hunt and stay in New Zealand exactly what the client wants. 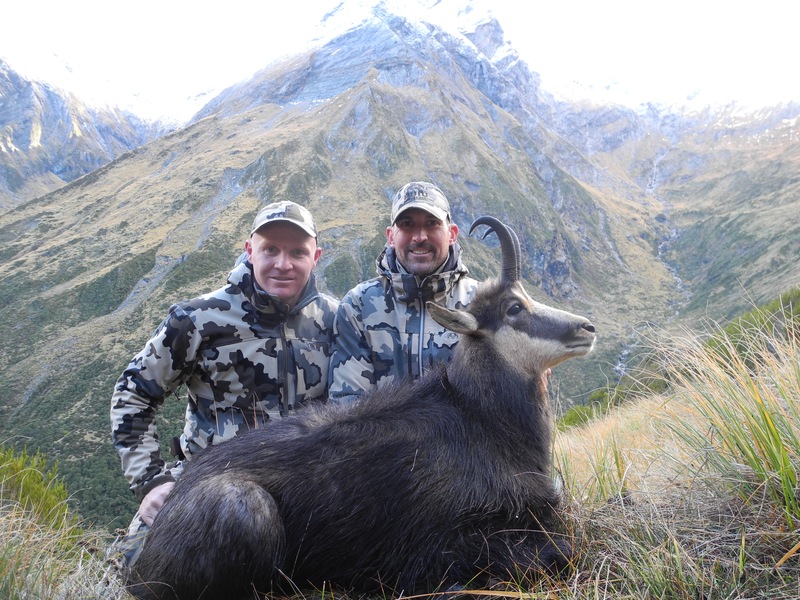 His Business, Exclusive Adventures New Zealand is focused purely on the clients needs, and ensures his clients adventures are the best New Zealand can offer. 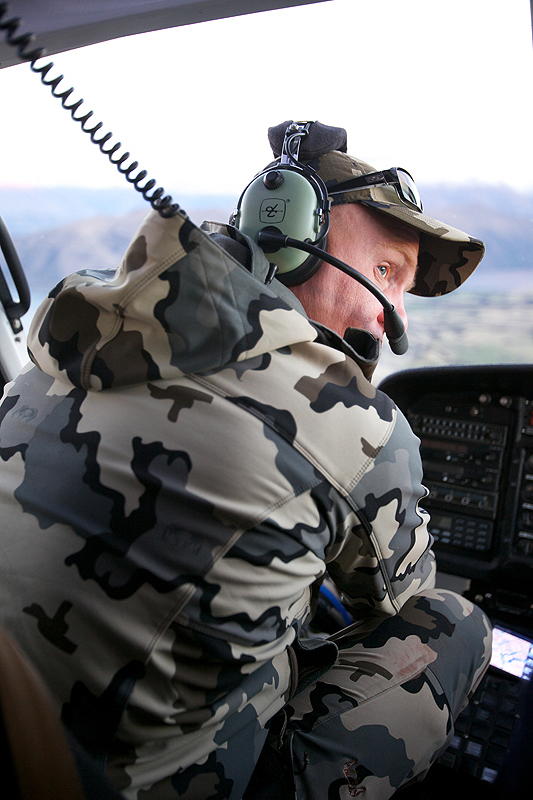 We flew into an area 30 miles East of where we hunted Tahr. 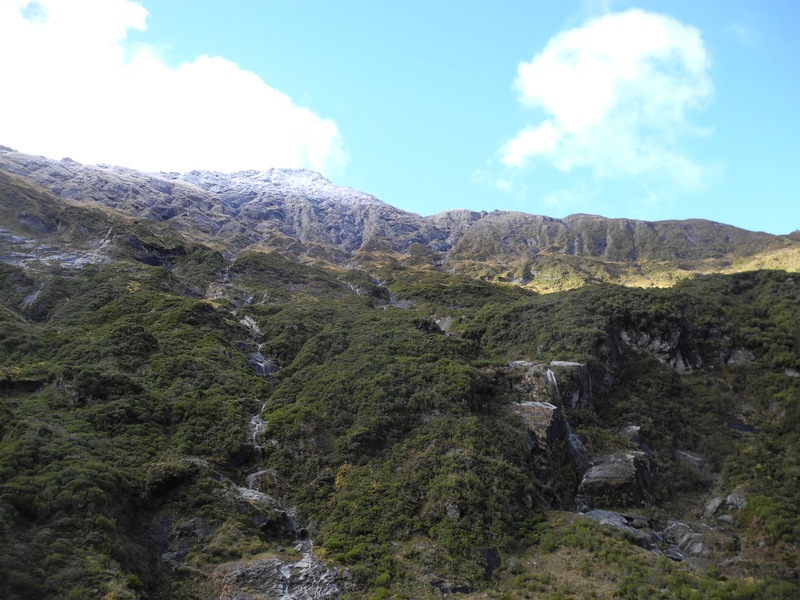 We set up camp in a narrow canyon bottom that was bordered with Rainforest that expanded up to the tree line opening up into steep basins and large rock peaks and cliffs above the snow line. Chamois can be found in any of this habitat but really thrive in the steep nasty stuff above timberline. We hiked and glassed that afternoon and evening without spotting a Chamois. The country was big, steep and breathtaking! It was like something out of a movie. The night was clear and the canyon was cold, 10 degrees Fahrenheit. Everything was frozen solid at dawn. 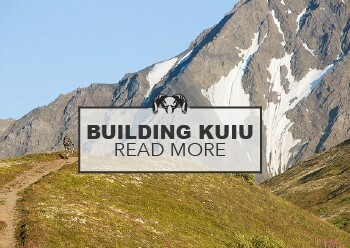 I slept in a 30 Degree Super Down Sleeping Bag Prototype, 185 Merino top and bottoms, Super Down Hooded Jacket and Pants and inside the new KUIU Prototype 2 man tent. I plan on sleeping in part if not all of my layering system when it gets cold. Not just because I make it the clothes and love them, but it lets me get away with bringing a 30 degree bag, which saves me weight and bulk. All four of us headed up the canyon, glassing for Chamois all morning. Around 11am, we reached a fork in the canyon with two very good looking drainages. Brendan and Bruce when left, Shaun and I headed up the drainage to the right. 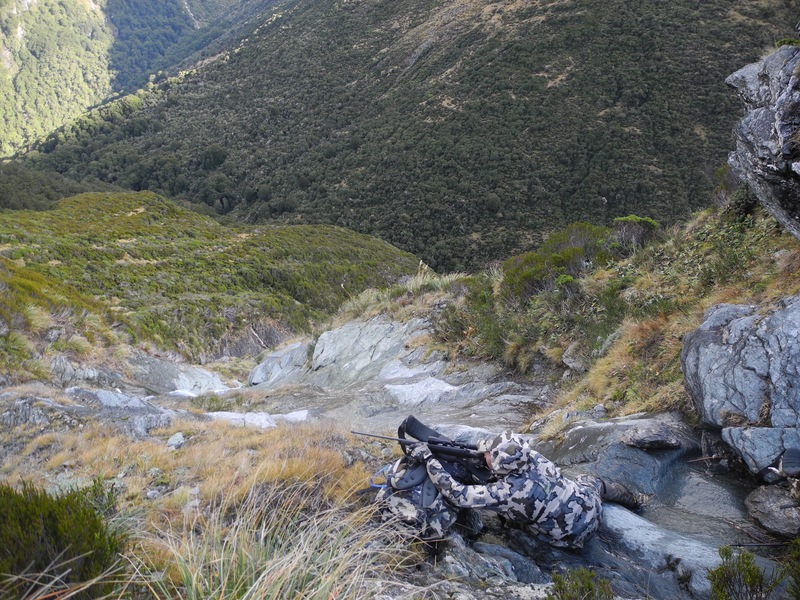 Brendan and Bruce covered a huge amount of ground looking for a group of Chamois with no luck. Shaun spots a group of Chamois including a good buck from the river bottom. The challenge was going to be getting to them. The Chamois were located at the top of an almost vertical basin 3200 feet straight up. The stalk was incredible. We climbed up a small ridge to a small bench made by a waterfall that gave us access to a small drainage chute. Fortunately, the drainage chute was dry and we were able to scaled up it for over 2500 Vertical feet to get above the Rainforest line. Notice all the small waterfalls in the photo above, that will give you some perspective to how vertical this climb was. I was thrilled to be in my the new Zamberlan’s, being able to front point in this terrain made a massive difference during this ascent. After a couple of hours of very technical climbing we reach the timberline and began closing the distance on where we last spotted the buck. 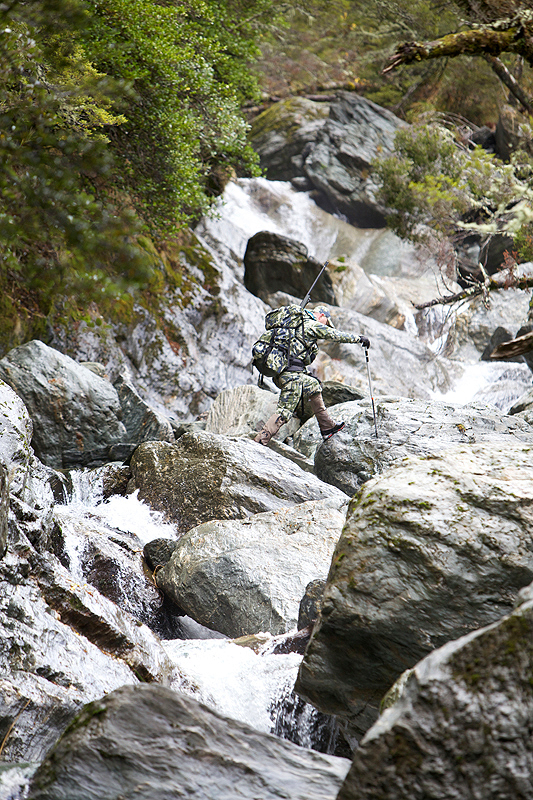 Shaun moves around and hugs a rock face as we move onto a flat above a waterfall. 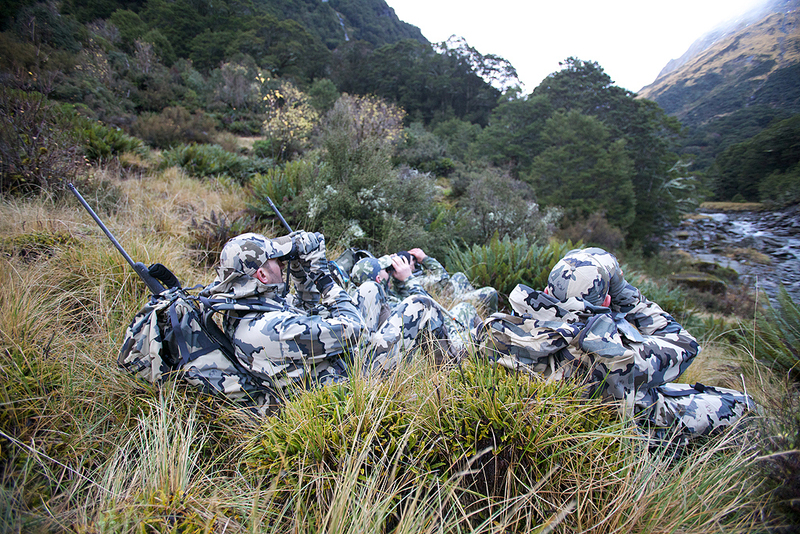 He quickly looks back, very seriously at me and tells me to get around the rock and get my rifle out. I know by the look in his eye he has spotted the buck. Without much hesitation I move around the rock (thankfully because after looking back at that move I doubt I would have done it had it not been for the focus of the buck). 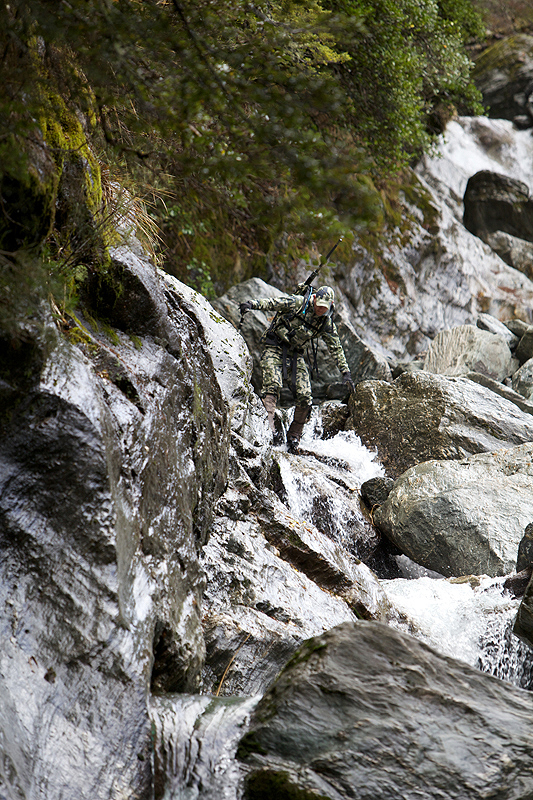 I drop my pack pull out my rifle and lay it across my pack. 180 yards in front of us was the buck, on top of a finger ridge looking our way. As I was settling my crosshairs on this front shoulder he turned completely broadside and my rifle went off. 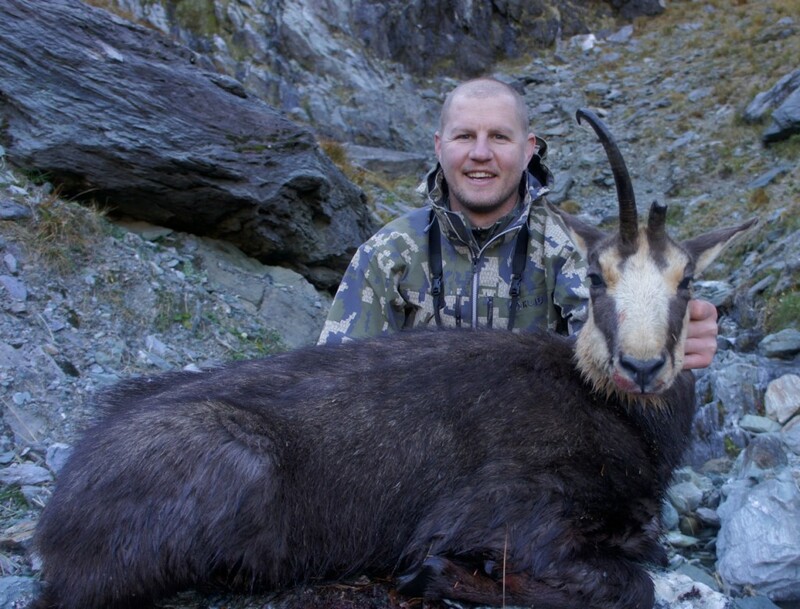 This is a great Chamois, heavy horns and a very mature animal. 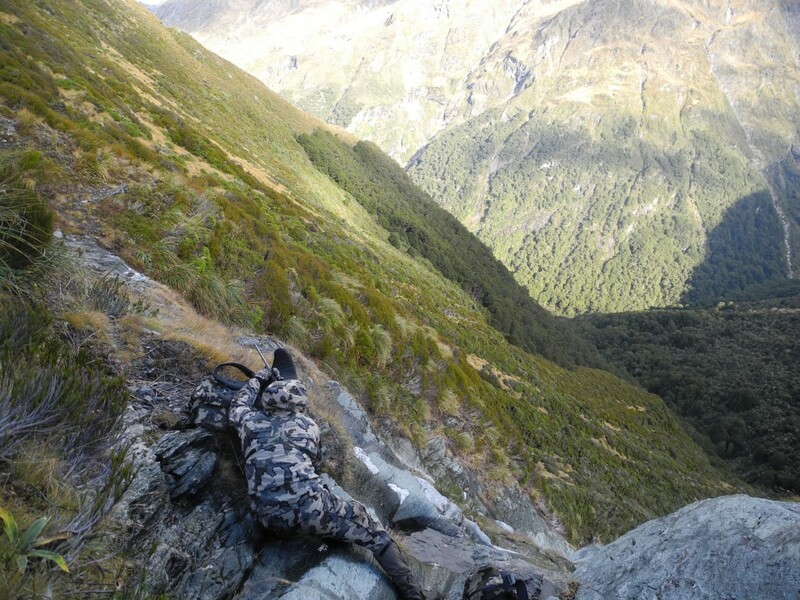 As we were examining the buck, a nanny Chamois above us started running straight down the mountain. Shaun told me to get my rifle ready. He whistled, the nanny stopped and the rifle went off. She is a gorgeous, long horns, old and a really, really nice trophy. We caped and boned and packed up our Icons for the climb off this mountain. Shaun and I both agreed we could not get down what we came up. We made a sidehill across the basin, hoping we could get around to a ridge above camp to get down. We were able to safely get down, I was happy but mentally exhausted, the stress of such steep terrain wears you out because every step has to be double checked to make sure it is firm. You do not want to slip or take any chances. This stalk was the most technical I have ever been on. We had to be VERY careful on foot holds and hand holds for most of it and it made the entire experience very rewarding and memorable. 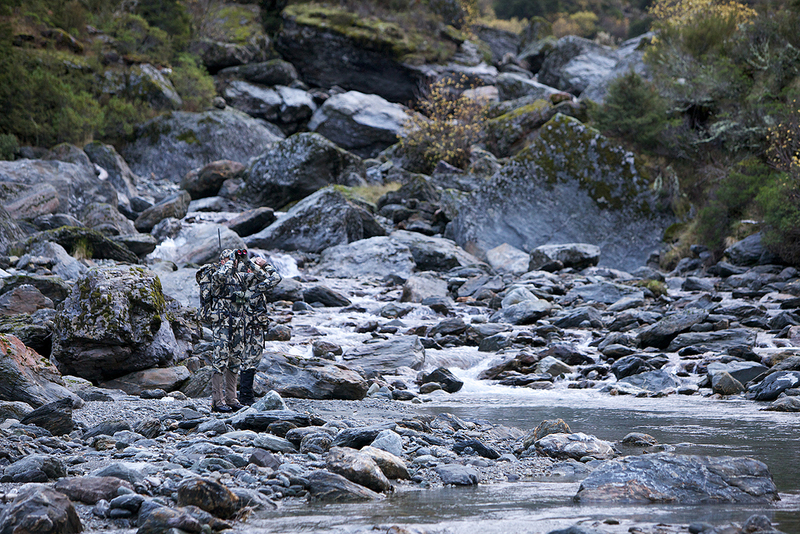 At day break, Brendan and Bruce made a stalk on a group of Chamois down stream from camp. The helicopter was scheduled to pick us up in the early afternoon. Brendan and Bruce had not made it back to camp by the time the pilot arrived. The pilot flew Paul and I and everyone’s gear out and went back and picked up Shaun. They flew looking for Bruce and Brendan and finally found them on the side of the mountain with a couple of really nice Chamois. The pilot flew into the mountain and Shaun was able to rope the two Chamois to the bottom of the Hughes 500, load up Brendan and Bruce and flew them off the mountain. They were very lucky, because they could not get down the way they came up and were not exactly sure how they were going to get off the mountain safely. 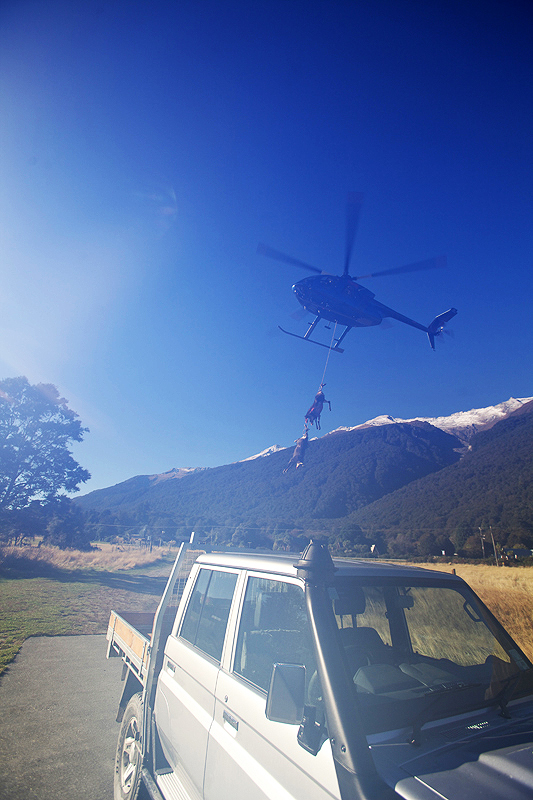 He flew them right to the heliport with the Chamois still hanging from the bottom of the chopper. Only in New Zealand! Shaun put together a morning Red Stag hunt for us on a 22,000 acre Station (ranch) that has a good population of free range Red Stag. During the morning, we spotted several groups of Red Deer with a couple of smaller stags. Nothing Shaun felt was worth stalking. Later in the morning Shaun found a lone bull that was not really long, but had a lot of character and was a great representative bull. He was in a small basin that set up well to get in close. Shaun, Brendan and I made a nice stalk putting us about 100 yard from the Stag. One shot and what an end to an unbelievable adventure. I have never packed so much quality hunting into 8 days before. And all of it was so well planned down to the smallest detail. 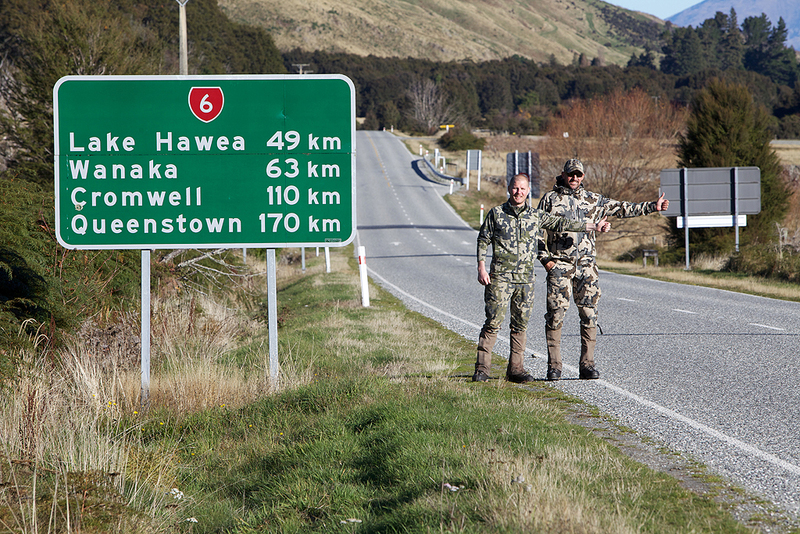 We never saw another hunter, the hunting was exceptional and Shaun and Bruce were as good of guides as I have ever hunted with. Bruce is an absolute Superman in the Mountains and I really enjoyed picking his brain everyday about the gear he uses. I learned so much from his lifetime in these mountains. The Oxbow lodge with Lloyd and Julie make the trip just that much better and you truly feel welcomed. Such a nice touch. 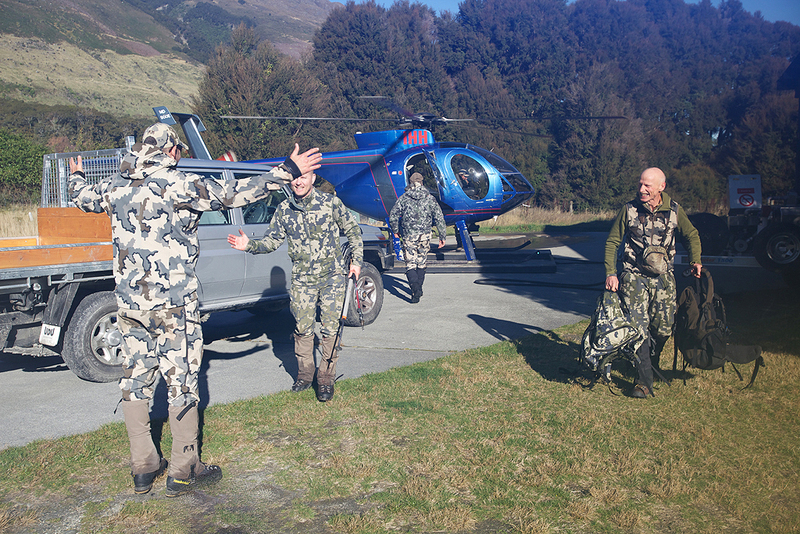 New Zealand is an incredible place to hunt, stunning scenery, easy and inexpensive to get to and is a fantastic place to bring your wife and family. Shaun will custom taylor your experience to however you wish. 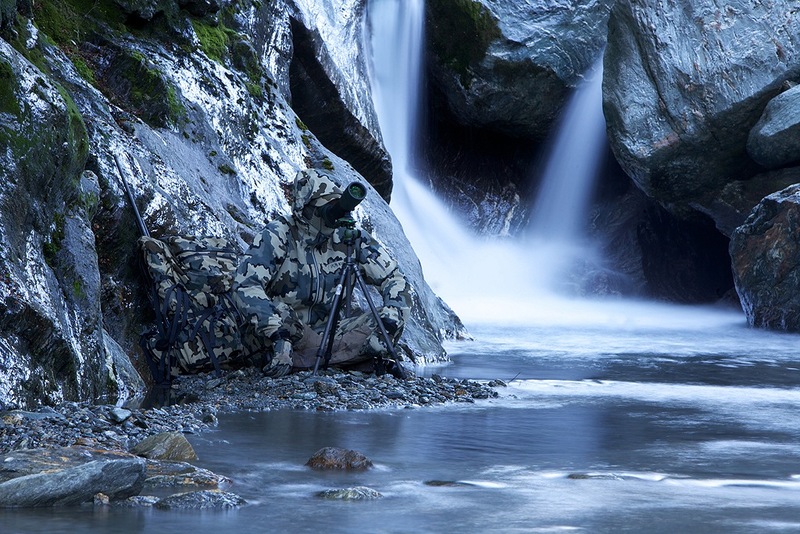 From hunting to free diving to helicopter wine tours, how ever you want to spend your vacation. Shaun will spend the time with you to make sure you get every detail covered. I cannot thank Shaun and his business Partner Ben Ferguson enough for putting together a trip that crushed all of our expectations. I could not be more sincere in recommending Shaun and Exclusive Adventures New Zealand to put together a trip of a lifetime for you. Many, many thanks to share this great adventure with us. Incredible and nice photos! Jason, it looks like a insane trip! The pictures are worth a thousand words, beautiful!! Great story, keep them up, they are great to read. Thanks Kurt! More to come this season. Thanks Matt. I am looking forward to taking my bow down there. Jason, Great trip and photos. Glad you are all back safe and content. From the visible details, it appears that it was cold. Did you stay out overnight? How did the clothes work out? Just right? Super Down would have been better? Yes it was cold. We made it back to our tents every night. 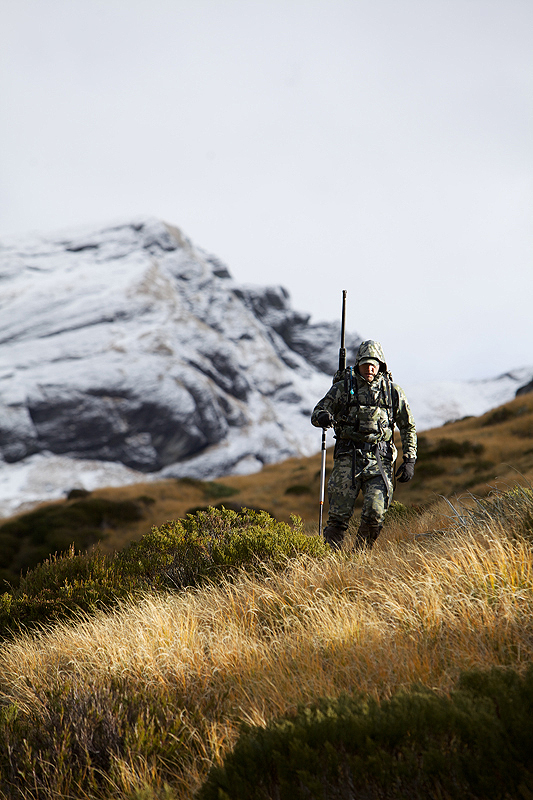 I brought only our Merino 185 top and bottom, Super Down Hooded Jacket & Pants and the new Yukon Jacket and Pant. When we were hiking I was just in the 185’s and the Yukon. We sat to glass I put on the Super Down Jacket and Pant. It was a perfect set up for this hunt. I was testing an new Prototype tent and Super Down sleeping bag and was very comfortable. Wow! My knees hurt just looking at the photos. Ha Ha. Yes it was steep. Great hunt Jason. My wife and I were there in June of 2012 and had a fantastic trip. Did you fly with Harvey? it looks like him and his copter, great pilot and your pictures are outstanding!! 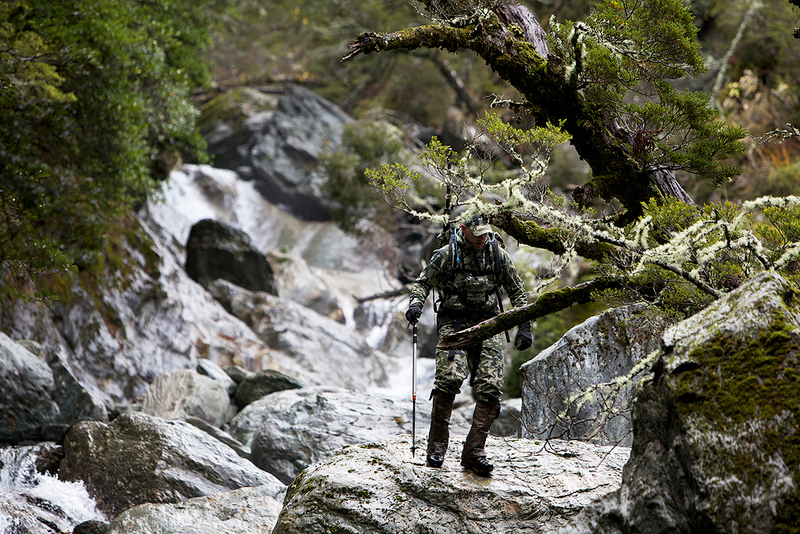 Kuiu is the best gear for that type of hunting! Yes I did fly with Harvey. One of the best pilots in the business. Thanks for the nice comments. Hey it’s good to see you on Instagram!! Great job guys and I recognize that helicopter. Words cannot describe how beautiful that South Island is. 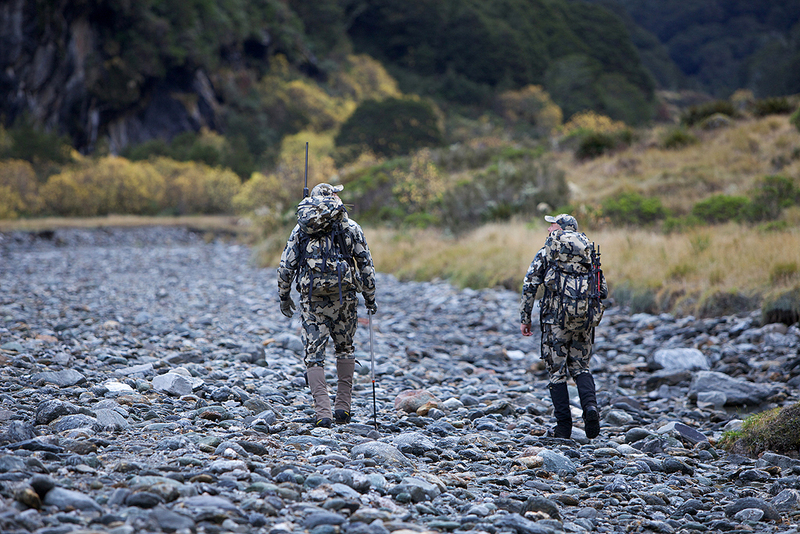 Lived in NZ for a year but never had a chance to hunt…man this trip makes me want to go back! The South Island is one of the most remarkable places I’ve ever been. Thanks for posting and sharing such awesome photos. Thanks Adam! It is a remarkable place, I was blown away. A great finish there, Jason. Some great trophies and stories! Awesome adventure Jason. I’m really interested in the tent as I’m looking for a new one here soon. 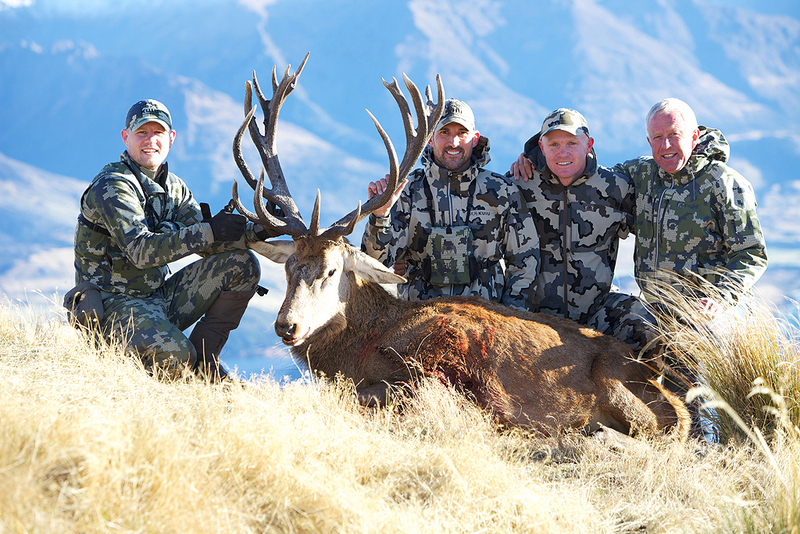 Thanks for sharing your experience and enthusiasm for the hunt with all of us. The tent development is awesome! I am working with Easton and Toray and my design input working with the best tent development room in the business. We have developed the most advanced tent ever produced. It is really light and super stable. More to come on this later this summer. Sweet hunt and great country! It’s cool to see you working on a sleeping bag AND tent. Tents are a lot about personal preference but it looks the one you have pictured would satisfy my check list. Justin this tent project is right in you wheelhouse! The finest materials ever pulled together in a tent line. 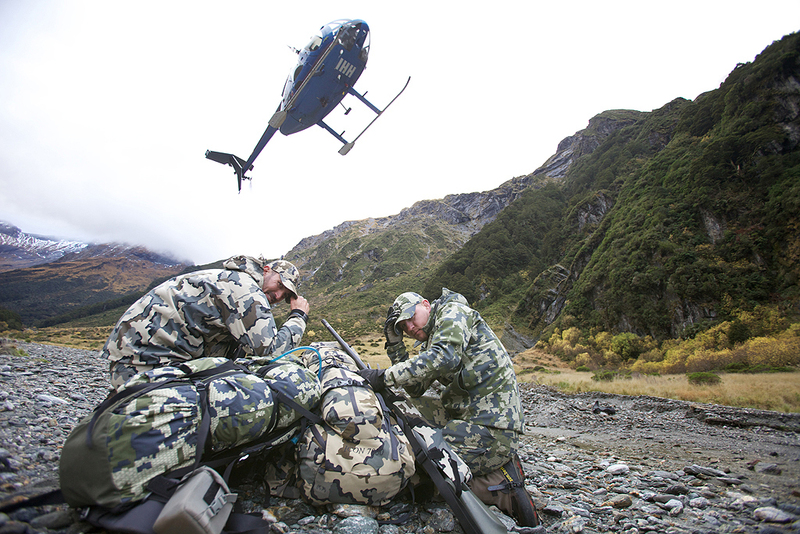 Will we see any news on the KUIU Boot production in the near future? 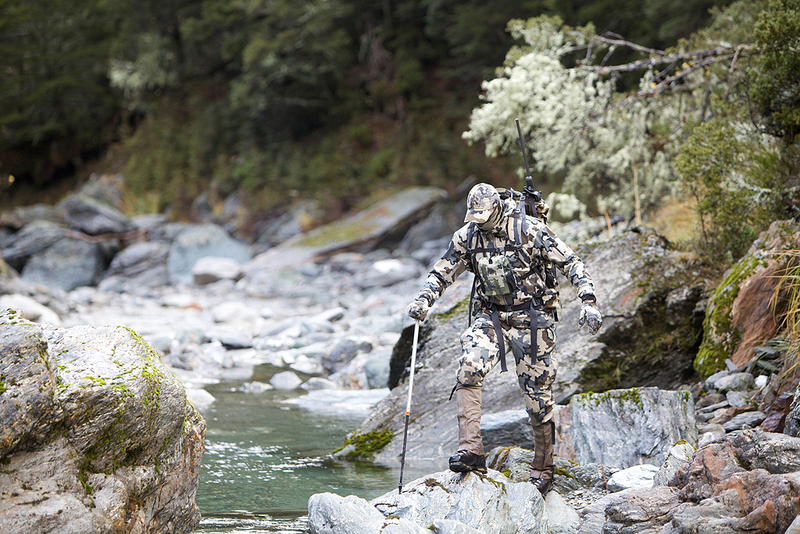 How did the prototype perform on this hunt? Yes very soon. I will be doing a post and video on the boots with all the technical information and preorder details later this month, once we get through all of our new product introductions. I placed the order for the boots with Zamberlan June 1st. I will be visiting their factory in Italy later this month and I will shoot video and photos for all to review. The expected delivery is early November. Very comfortable, great stability and traction, high breathability and very durable. They are the best boot I have ever worn. Amazing story! It really looks like a blast. I like how you’re pushing for that 30 degree bag. I agree that clothes are part of the system. Something I still need to remind myself of though because I hate sleeping in clothes like a jacket and pants. I guess if you’re hunting in Montana or Alaska you’d be all dressed and ready to go if a bear got too nosey. I am so used to it now that I do not like to not sleep in my clothes. It makes getting up in the morning or at night really fast! Or in dealing with a bear. My daughter and I meet you in the customs line in NZ. I was the one that lost his luggage. Looks like you had a terrific hunt, thank you for sharing! 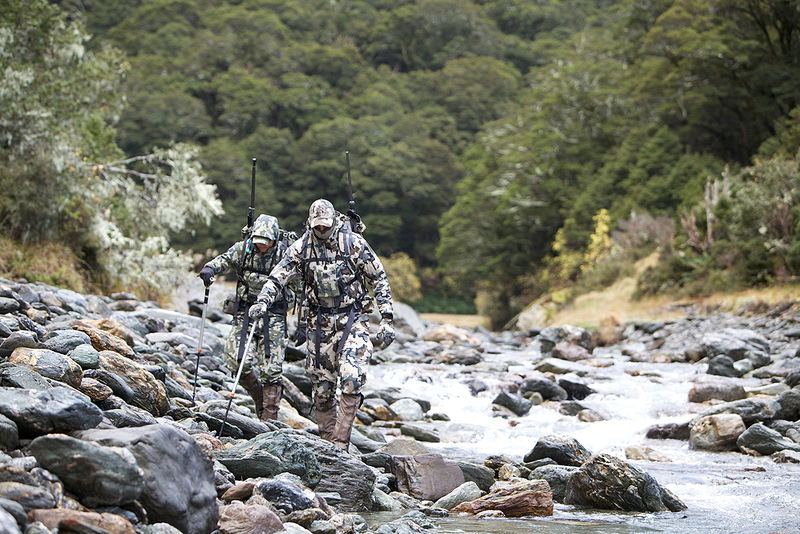 We also had a great hunt and your Guide gear I wore worked better then any other clothing I’ve used. I posted some photos that are in your photo album. It was really nice to meet you. I was wondering how your trip went, then I saw your photos in the album. 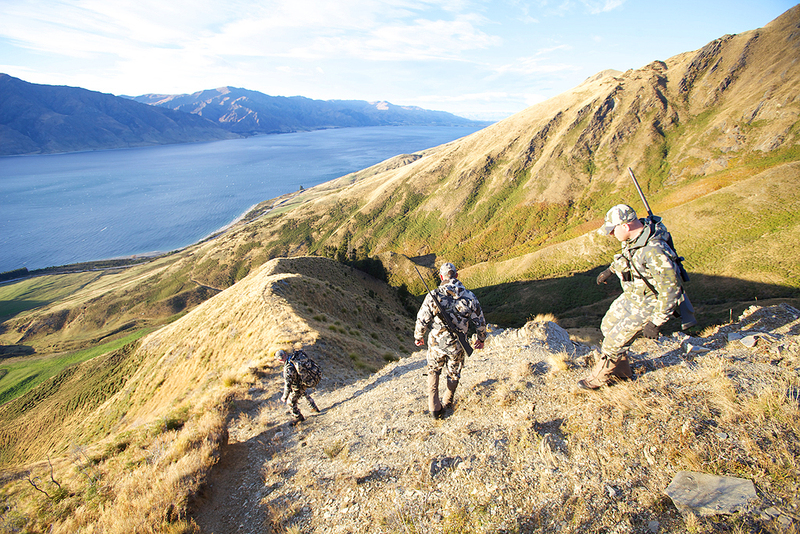 What a great place to hunt. Thank you for the comments on the gear, I am so glad it worked well for you!! Congrats on a excellent hunt. I will be out of the army this fall after 11 years, I am looking forward to spending more time with my family and hunting, and hopefully go on some adventures like that. Love the gear, keep up the great work. As a rifle hunter, you can get away sleeping in your clothes. 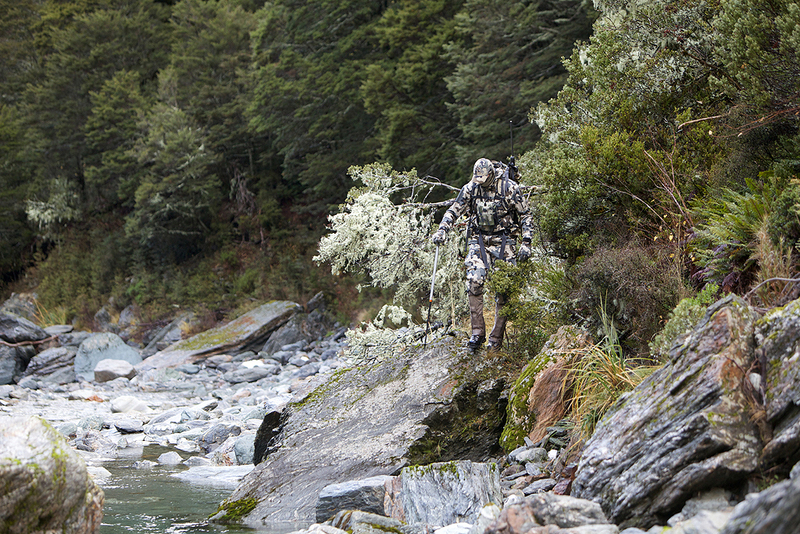 As a bowhunter, although the seasons are warmer, I try to do everything possible to eliminate human and other scent. Sleeping in your clothes is not one of the things that helps you do that. AWESOME!!! COngrats on such a great hunt!! 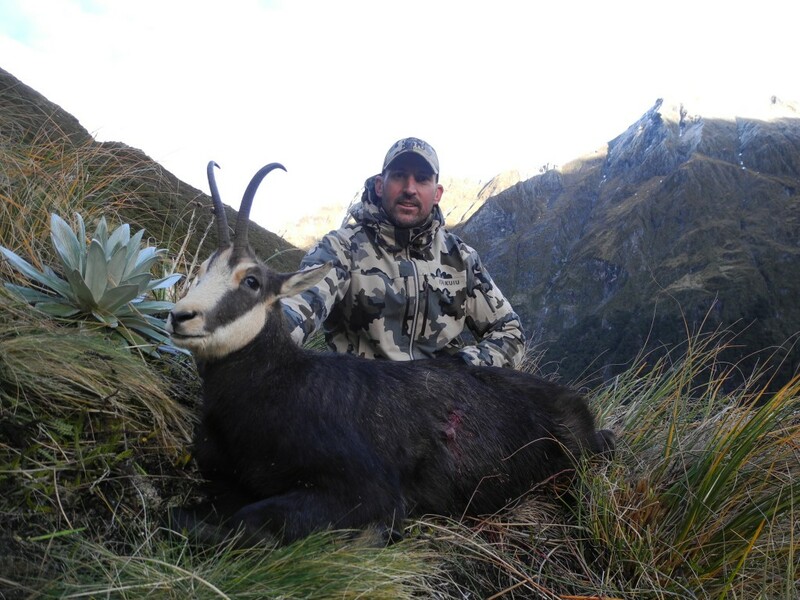 You can easily get addicted to chamois hunting, its such an awesome animal.. Thanks for sharing!!! Whats up next?? You guys are having a great time and even getting to test some protype gear at the same time. Congrats on a super hunt your both having! New Zealand is on my bucket list in the very near future! Glad you had a great hunt. Brendan too. I know the beauty that New Zealnd has to offer as I guided there on the South Island! What a treat it was! Looking forward to the tent BTW! Once again great photos and animals! 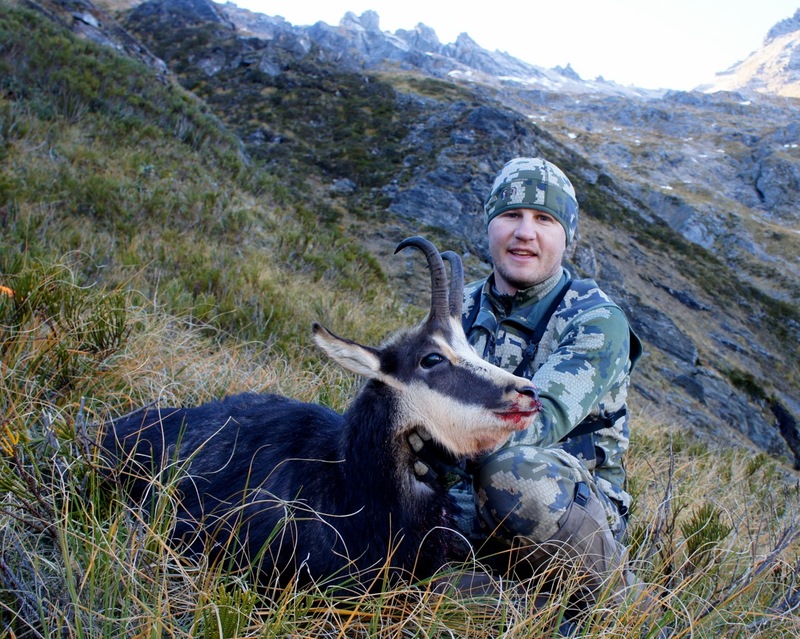 That’s a hunt that I need to add to my list after seeing photos of those mountains. Looking forward to hearing more on the Zamberlan boot. My boot purchase for this year will probably be made by the time these are out, but I’m still considering them for 2014. 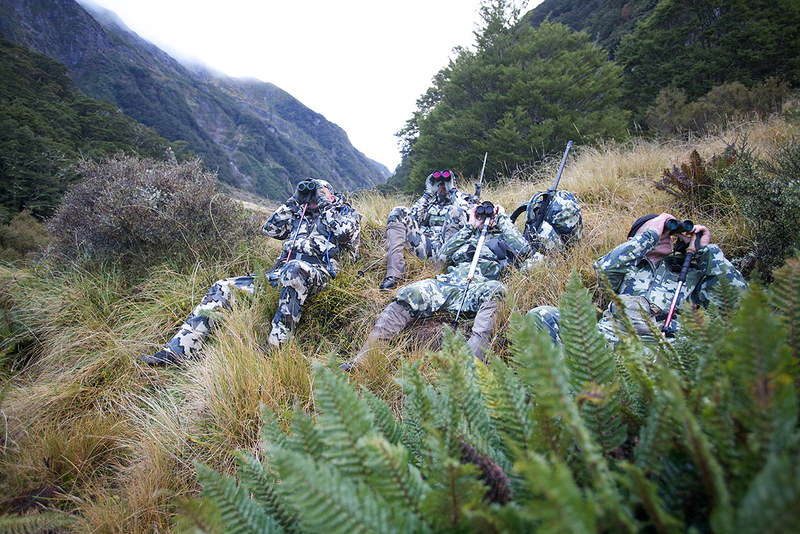 Great hunts and great stories. Thanks for sharing. My wife and I are ready talking about going back and Ill checkout Exclusive Adventures. Flippin’ killer adventure! One of my “bucket list” hunts since I was a kid. Someday I will make this happen! Thanks for sharing, Jason. 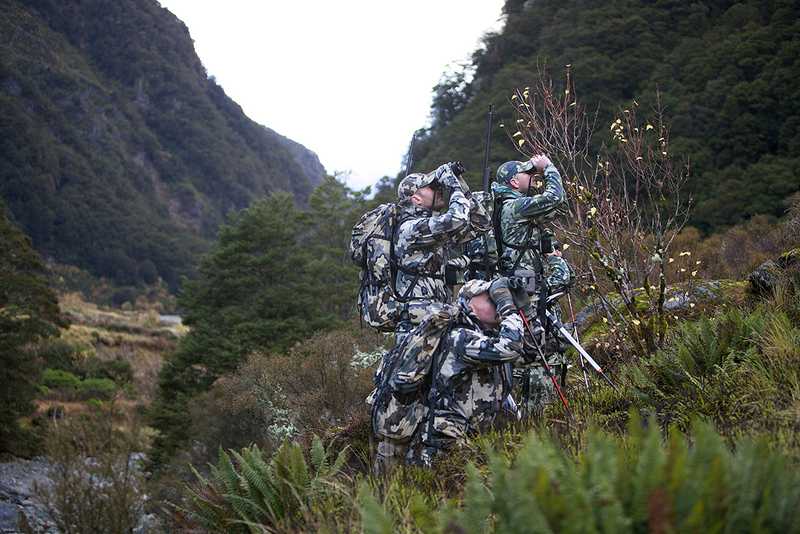 A kuiu tent that is super light and strong would be sweet. Your tent prototype would be awesome if you extended the vestibule pole like on a hilleberg allak to do this. Just a thought. 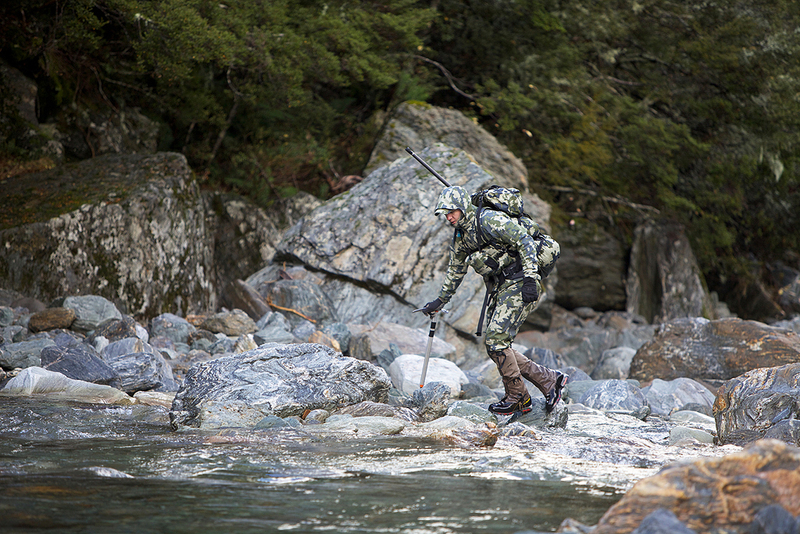 I am going on a backbacking hunting trip this fall and I am interested in buying one of those pick ax/walking poles. Does anyone know where to find the one used in these pictures? This is a Petzl Snowscopic, which is an Ice Axe with an extension to make it a walking pole. I love this tool! I have heard that they are no longer making them? But you may stiff find them on line?